At the meeting on August 30th with Goring, Hitler stated that he had decided that he would withdraw his ban on the bombing of London and showed that he was now keen on regular attacks on the British capital in retaliation for the consistent attacks on Berlin. Across the Channel, Goring and his party of invited guests started to take their positions on the cliff edge. Everyone is relaxed, talking and smiling with a sort of waiting in anticipation. It looked like a picnic day for the rich. Suddenly, in the distance the dull drone of engines could be heard, it was coming from the south. Shortly, the same sounds could be heard from the north, an eerie sort of sound yet you could not see anything. After about ten minutes, one of the Majors called and pointed to the south. The first of the huge formations could just barely be seen over the high ground behind them. All eyes were at straining point, some members of the Party were on tip-toes stretching their necks to get the first glimpses of the great armada of bombers that were soon to fill the sky. The huge armada of German aircraft was now over the coast and within the range of the Observer Corps posts. They report in to the Maidstone HQ that: “Enemy sighted, 100 plus, 20,000” within moments, they would lift the telephone again: “Further to my last report…make that 200 plus,” and so it continued. In reality, a total of some 1,100 aircraft were crossing the English coastline consisting of 300 medium-heavy bombers, 200 bf110s with bomb loads and about 600 bf109s flying as escorts. Meanwhile all over London Regional football matches were about to start at 3pm. They were playing Clapton Orient (later to become Leyton Orient). Little did they, and the sparse crowd of around 1,000, know what would follow. I say ‘collection’ as the previous week a match was played at Fulham and our star player Dave Mangnall fractured a bone in his left ankle. Such were the problems of wartime football and the Regional games were a compromise form of playing football with no leagues as such. Across London other games started at various grounds including Chelsea, Charlton, Arsenal and West Ham. Unfortunately no reports could be found of the R’s game, but we do know it was recorded as a 3-3 draw and that Wilf Bott scored two of the goals and Alf Ridyard the other. But, this does not tell the whole story, because, along with games at Chelsea, Arsenal and West Ham, the game was abandoned probably not far from the end of the second-half as bombs were falling in East London and sirens were wailing across London. ‘At one football match in the London area despite the thunder of the AA fire and enemy planes, the game was played to a finish. Four thousand people at a football match had a grandstand view of the air battle. ‘They played football in the war zone yesterday. 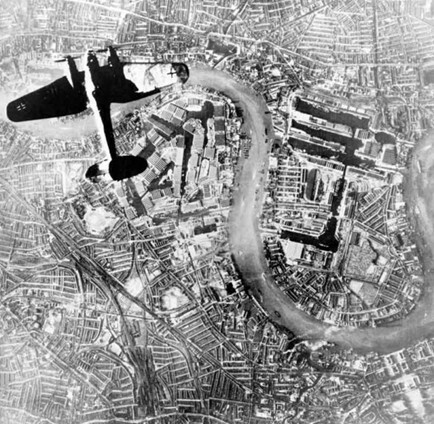 London area matches ended with Goring’s bombers overhead chased by our fighters and fired at by our AA guns. Players and crowd never turned a hair. In the Charlton v Millwall match players began to troop off when they heard the warning. The referee called the players together and told them that there was only a minute to go anyway. The match was then completed. It ended: Charlton 2 – Millwall 4. Meanwhile somewhere in London that day three bombs fell on a greyhound track with 6,000 people awaiting the first race. Two bombs fell outside the stadium but one fell on the track. Miraculously nobody was killed or injured. 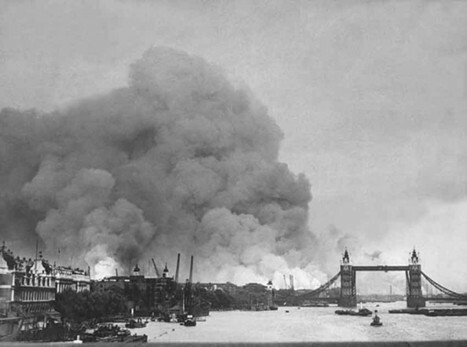 The outcome of the matches played that day, were of secondary importance compared with the loss of life that would follow this start of the Blitz. In total 43,000 would die and 140,000 would be injured during the weeks that followed. More than a million homes were damaged or destroyed. Good research Colin. Amazing how Pro football was still being played at that time. Even more incredible in a book I once read about history of German Football they were still playing in the country in 1945 when the Russians were on the outskirts of Berlin!